Reinsman Breast Collars - Safety Comfort and Performance for rider and horse. Reinsman Horse Equipment - "Quality has a style all its own." If you are searching for tack built better than most, Reinsman is a great choice. Reinsman built a prominent reputation with their bits and pads. The same quality you have come to expect is definitely part of their leather goods selection. Remember that a breast collar is a great addition to your saddle purchase. Many people think the breast collar is only to keep the saddle from slipping back. For a small investment, you can add an emergency measure that could prevent a saddle from twisting under your horse, should a girth loosen without your knowledge. On a typical day, a horse can loose 2 inches of girth from sweat and work. Your saddle can loosen before you realize it! The breast collar helps stabilize the saddle. Since it goes around the neck, the horses neck will usually only allow the saddle to slip so far around the side of a horse. (I remember a time I was riding, in saddle, on the belly of a young horse to be saddle broken, at a full bucking run, wondering whether to let go and get hurt, or stay on as long as I could and keep getting hit by hooves, until said animal got tired and stopped! I ended up carthcing it all, then having to chase the horse.) Any saddle can have breast collar dees added. If the saddle has enough area where the girth rigging ties, you can use the same ring for breast collar tug straps and girth tie strap. Still, sometimes you may want a higher positioning of those tug straps, or may want double straps for more security. Tooling patterns can match the saddles. Full tooling will "pack" the leather for durability and strength. Tooling can hide small "range" scars that are inherent to the leather before it is formed into a saddle part. Tooling adds depth and beauty to the leather. Tooling is just a little more effort to clean than a plain saddle. The more elaborate the tooling design, the more value, the more time involved in production, and the more your investment will grow over time. 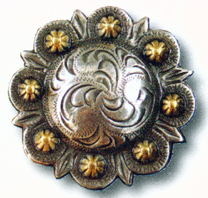 Matching conchos can be obtained to add a little more decor to your breast collar. Just let us know if you want more trim than is shown, or different trim than is shown. 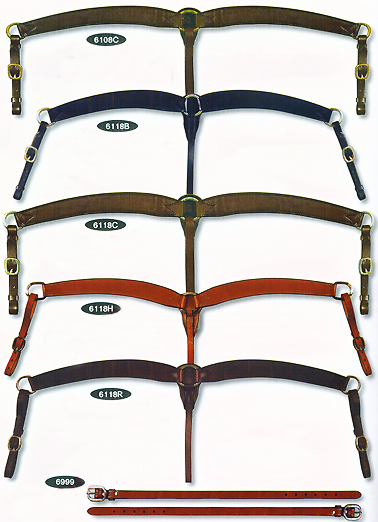 We advise selecting a matching breast collar when placing your new saddle order. But, we can get replacements, others to go with your other saddles, or order them after the fact too. With the experience of thousands of saddles made for thousands of horse people, Cultured Cowboy looks forward to helping you with your needs. 6930R Tyler Magnus 2 inch Breast Collar. Rosewood leather. Snowflake tooling. Stainless Steel D rings. Double & Stitched. Designed to match any of the Tyler Magnus saddles. Compare At:$231.00 CC Price: $192.99 6940R Tyler Magnus 2 3/4 inch Breast Collar. Rosewood leather. Snowflake tooling. Stainless Steel D rings. Double & Stitched. Designed to match any of the Tyler Magnus saddles. REIN6931R Tyler Magnus 2 inch Breast Collar. Rosewood leather. Spider tooling. Stainless Steel D rings. Double & Stitched. Designed to match any of the Tyler Magnus saddles. Compare At:$165.00 CC Price: DISCONTINUED 6941R Tyler Magnus 2 3/4 inch Breast Collar. Rosewood leather. Spider tooling. Stainless Steel D rings. Double & Stitched. Designed to match any of the Tyler Magnus saddles. 6940R Tyler Magnus 2 3/4 inch Breast Collar. Rosewood leather. Snowflake tooling. Stainless Steel D rings. Double & Stitched. Designed to match any of the Tyler Magnus saddles. 6931R Tyler Magnus 2 inch Breast Collar. Rosewood leather. Spider tooling. Stainless Steel D rings. Double & Stitched. Designed to match any of the Tyler Magnus saddles. 6941R Tyler Magnus 2 3/4 inch Breast Collar. Rosewood leather. Spider tooling. Stainless Steel D rings. Double & Stitched. Designed to match any of the Tyler Magnus saddles. 6111H Reinsman X Series 1 1/4 inch Breast Collar. Barrel racing or pleasure breast collar. Honey color leather. Spider tooling. Stainless Steel hardware. Double & Stitched. Designed to match Reinsman barrel and pleasure saddles. 6112H Reinsman X Series 1 1/4 inch Breast Collar. Barrel racing or pleasure breast collar. Honey color leather. Running W tooling. Stainless Steel hardware. Double & Stitched. Designed to match Reinsman barrel and pleasure saddles. 6931H Reinsman X Series 2 inch Breast Collar. Honey color leather. Spider tooling. Stainless Steel hardware. Double & Stitched. 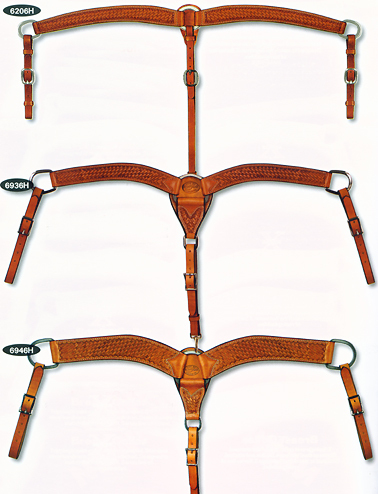 Designed to match Reinsman roping and pleasure saddles. 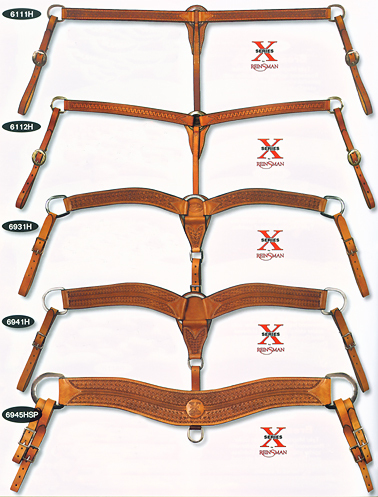 6941H Reinsman X Series 2 3/4 inch Breast Collar. Roping breast collar. Honey color leather. Spider tooling. Stainless Steel hardware. Double & Stitched. Designed to match Reinsman roping saddles. 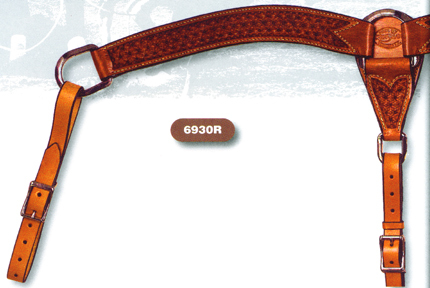 6945H Reinsman X Series Tripping Breast Collar. 1 piece Heavy Duty roping breast collar. Honey color leather. Arizona Flower tooling. Stainless Steel hardware. Double & Stitched. Designed to match Reinsman roping saddles. Double Tugs. 6110H Reinsman X Series 1 1/4 inch Breast Collar. Barrel racing or pleasure breast collar. Honey color leather. Snowflake tooling. Stainless Steel hardware. Double & Stitched. Designed to match Reinsman barrel and pleasure saddles. 6930H Reinsman X Series 2 inch Breast Collar. Honey leather. Snowflake tooling. Stainless Steel D rings. Double & Stitched. Designed to match Reinsman barrel and pleasure saddles. 6940H Reinsman X Series 2 3/4 inch Breast Collar. Honey leather. Snowflaker tooling. Stainless Steel D rings. Double & Stitched. Designed to match Reinsman X Series roping saddles. 6945HSF Reinsman X Series Tripping Breast Collar. 1 piece Heavy Duty roping breast collar. Honey color leather. Honey leather. Arizona Flower tooling. Stainless Steel D rings. Double & Stitched. Designed to match Reinsman X Series roping saddles. Double Tugs. 6206H Reinsman 2 inch Contoured Breast Collar. Honey color leather. Hand stamped Basket Weave tooling. Double & Stitched. Skirting leather topside lined with soft leather next to your horse. Designed to match Reinsman pleasure saddles. 6936H Reinsman 2 inch Contoured Breast Collar. Honey color leather. Hand stamped Basket Weave tooling. Double & Stitched. Stainless Steel. Designed to match Reinsman roping saddles. 6946H Reinsman 2 3/4 inch Contoured Breast Collar. Honey color leather. Hand stamped Basket Weave tooling. Double & Stitched. Stainless Steel. Designed to match Reinsman roping saddles. 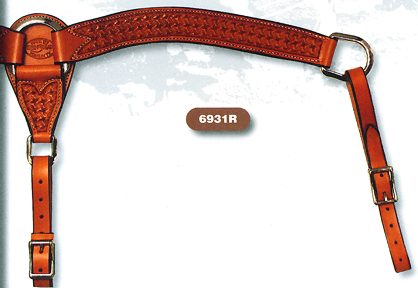 6933H Reinsman 2 inch Contoured Breast Collar. Honey color leather. Hand stamped Diamond Waffle tooling. Double & Stitched. Stainless Steel. 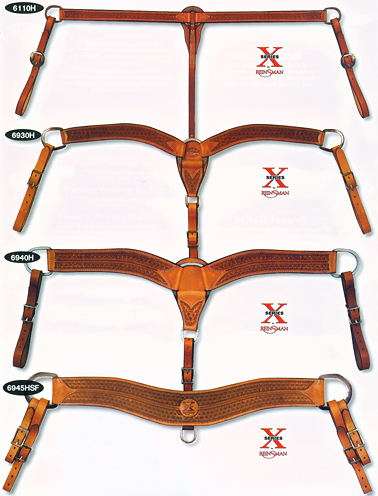 Designed to match Reinsman roping and pleasure saddles. 6943H Reinsman 2 3/4 inch Contoured Breast Collar. Honey color leather. Hand stamped Diamond Waffle w/ Dots tooling. Double & Stitched. Stainless Steel. Designed to match Reinsman roping saddles. 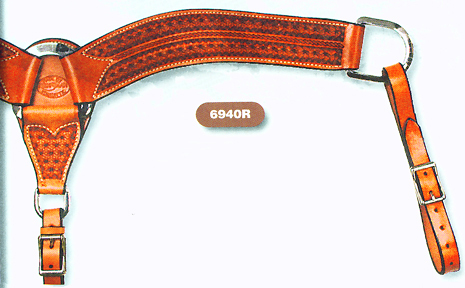 6945H Reinsman Tripping Breast Collar. 1 piece Heavy Duty roping breast collar. Honey color leather. Arizona Flower tooling. Stainless Steel hardware. Double & Stitched. Designed to match Reinsman X Series roping saddles. Double Tugs. 6929N Reinsman 2 inch Roughout Contoured Breast Collar. Natural color leather. Double & Stitched. Stainless Steel. Designed to match Reinsman X Series saddles. 6939N Reinsman 2 3/4 inch Roughout Contoured Breast Collar. Natural color leather. Double & Stitched. Stainless Steel. Designed to match Reinsman X Series saddles. 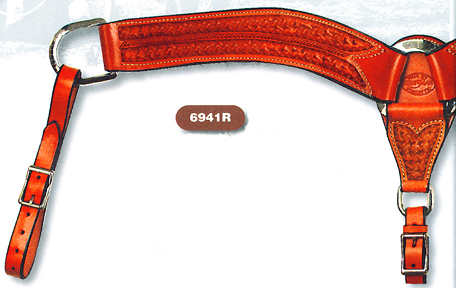 6934H Reinsman 2 inch Barbwire Contoured Breast Collar. Honey color leather. Double & Stitched. Stainless Steel. Snake tooling. 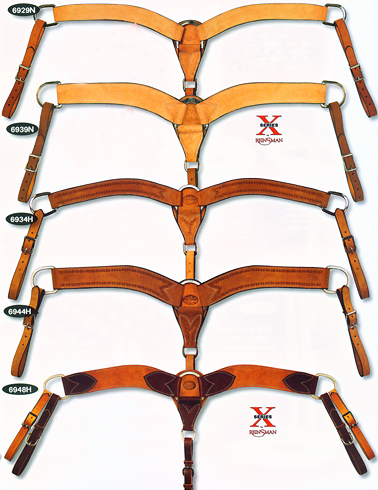 6948H Reinsman 2 3/4 inch Harness Contoured Breast Collar. Natural harness leather with Latigo ends. Double & Stitched. Stainless Steel. An all-time favorite roping breast collar. Double Tugs. 6108C Reinsman 2 inch Contoured Breast Collar. Coffee leather. Brass Hardware. Double & Stitched. Soft leather lining for comfort. 6118B Reinsman 2 inch Contoured Breast Collar. Black leather. Stainless Steel Hardware. Double & Stitched. 6118C Reinsman 2 inch Contoured Breast Collar. Coffee leather. Stainless Steel Hardware. Double & Stitched. 6118H Reinsman 2 inch Contoured Breast Collar. Honey leather. Stainless Steel Hardware. Double & Stitched. 6118R Reinsman 2 inch Contoured Breast Collar. Dark Rosewood leather. Stainless Steel Hardware. Double & Stitched. 6999H Reinsman Breast Collar Tugs. Honey leather. 6999B Reinsman Breast Collar Tugs. Black leather. 6999C Reinsman Breast Collar Tugs. Coffee leather. 6999R Reinsman Breast Collar Tugs. Rosewood leather. Custom Concho: Antiqued Silver with Jeweler's Bronze berries around the border. Extra conchos are available. Each comes with a Chicago screw back, or ask for a wood screw adapter that converts the Chicago screw into a wood screw. 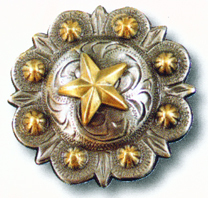 Custom Concho: Antiqued Silver with Jeweler's Bronze berries around the border, and star in the center. Look at the detail in both the hand carvings of the leathers and in the engraving of the silver. Each saddle is made by an artist with many saddles of experience under their belt. Their pride rides on the saddle made just for you. When you begin with the best quality leathers, and use professional craftsmen, you can finish with a look that can compete in your most important arenas. Oh yes, there is more Matching Tack! Camarillo Collection, and matching tack for almost all pleasure or trail saddles made. Cultured Cowboy can match every saddle. Call us if you have any questions. Our CC Prices are based on the absolute minimum margins mathematically possible to stay in business to serve you. We all want the best deal. Cultured Cowboy balances millions in inventory, with your best interest. For You, we will deliver more overall value for the buck than anyone; because, 1) we spend more time asking you, your trainers, instructors and judges, the questions needed, to get everything right for you. 2) we actually ride. 3) we study several disciplines and more than one breed, allowing us to cross over great ideas. 4) we have the experience of fitting hundreds of riders and their horses. 5) we respectfully ask the leather experts, craftsmen, tree makers and the saddle makers to work with us as a team. Making you the winning rider that you deserve to be always takes a willing team. These are a few reasons that we understand more about riding, and fitting than most! Cultured Cowboy carries a full complement of tack and accessories for you and your horse.